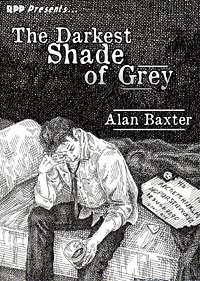 If for some reason you believe you don't have time to read a novel-length book, do yourself a favour and pick up this title by Alan Baxter.Already a self-confessed fan of Baxter's work, the Darkest Shade of Grey is one that I hadn't read. But its landscape is a place with which I am already deeply familiar. Walking the line between good/bad, through the veil of seen/unseen in Sydney, reading stories set in Baxter's two realms is kind of like coming home.And, to be fair, I hate it when I gush about a book. I hate it even more when the author is a friend, because it looks like pay for play.But the truth is, I ate a late breakfast after coming home from the market. And while I sat drinking post-brunch apple juice, I thought I'd read a few pages of this book. A little while later, startled at the fact that the story had already finished, I sat up and blinked and wondered where the time went.The Darkest Shade of Grey is a short story about an alcoholic journalist with a fraying life (you know the guy, you've seen him in a million works since the 1920s) whose fascination with the occult gets him into deep water. With, you know, demons. As with Baxter's other protagonists who tend to find themselves inadvertently wound up in these weird, dark, fantastical situations, David Johansson does just that. Curiosity got the cat, you might say.The beautiful thing about The Darkest Shade of Grey is that you are drawn into the story just far enough to become part of the protagonist's struggle, for just a tiny window of time. It's a well-formed short story, a snapshot of a life at a critical juncture: One that you will finish, startled, and then go back and re-read simply because you don't want it to have finished.Of note is that the ebook of this title is beautifully formatted; perfectly, in fact, for the screen. So, congratulations to the publisher for that - a huge amount of ebooks aren't purposely set, and to have one that is, is a great relief. Red Penny Papers puts out some fun serialized stories, and their latest has been released as a complete novella available for purchase.The story revolves around David Johanssen, a down-on-his-luck crime reporter who can read people's auras and glimpse moments from the pasts of the dead. While investigating the murder of a young woman in one of the rougher neighborhoods in a big Australian city, an old derelict approaches David on the street asking David to tell his story like he does for the dead. David brushes the guy off, his mind already muddied with the turmoils in his life, but the homeless man haunts him. And it's only when David finally confronts that he discovers the stranger is not the only one with a strange story to tell. And the investigation could either lead David to renewal or ruin.This might be the first time I've read Alan's work. It's the first I can recall at any rate, and it was definitely a story that suited me well. The gritty, almost hard-boiled style of the story worked well with the escalating weirdness that kept heaping on the main character. I don't know if I could get away with calling it urban fantasy, but if I can, then it's certainly the kind of urban fantasy I like. The suspense doesn't really build until about the midway point when an ominous figure gets between David and his story. Then, things get really interesting.The pace is a bit slow, but it's more character-driven than action-driven. The ending satisfies, though it requires a bit of charity by way of suspension of disbelief. I've got plenty of that to spare though, so it was no issue with me. Definitely a good find from Red Penny, and a nice introduction to Alan's work. If he's got more like this, I'll have to watch out for it. I read this serialised at Red Penny Papers.The character driven elements I thought worked well, and Baxter is efficient at evoking the setting without overly long passages of description. There is a slow burn through the first two episodes, but things escalate quickly after that. A few potentially cringe-worthy elements (Ouija board for instance) jarred with me, but didn't take me too far out of the narrative.The developing complexity of the relationship with Stella was well handled, and the introduction of the supernatural/paranormal was initially subtle before being ramped to 11.The ending left nearly as many questions as it answered. In truth most of the protagonists questions would have been answered in the readers' minds long before he came to terms with them. I was however left feeling that his problems were far from over, and that perhaps things were about to get a lot worse for him even without the level of supernatural skull-fuckery he'd dealt with in the tale.I didn't really intend to read this though, and it dragged me in and kept me hooked and I ended up getting through it in a day, snatching chances to read it on my phone between other things I really should have been doing. I figure that's the sign of a good story. Dark fantasy author Alan Baxter seems to move from his dark fantasy novels to a more classical horror story in this novella, exploring the world of a washed-up journalist who can see auras and whose minor brush with the supernatural has ruined his life and his family. But the move is smaller and less clear than one might think.This story attempts to explore that grey area between horror and dark fantasy (hence the title), shifting between the two halfway to shine a light on how the fantastical trickles down to terror at the street level. That shift is a bit jarring and sudden, and I kind of wish there had been more love for the classic occult level of the story, but the change will make the story all the more appealing for fans of Baxter's novels.Baxter is at his best when evoking the grubby streets of Sydney and the damaged folk that take shelter there, with a visceral strength to his depictions of that world. If you like your fantasy dark and your horror bleak, there may be plenty to like here. Check it out. Having read both RealmShift and MageSign, I had a good idea of the likely themes of this novella in advance. This is a good story, made even better by the author's style. In The Darkest Shade Of Grey, Baxter, as anticipated, effortlessly segues between real-life issues and his own brand of powerful, supernatural murkiness. The plot is fine, but the author's economy with words is what makes this (and his other works) such a good read. We are drawn in by the protagonist's daily problems, only to be thrown into an alternative world where both he and the reader are demanding answers that only Baxter can supply. As with all good stories we are provided with some closure, yet still left wanting more. The suspense does not stop, the characters are well-formed and the horror is a slow wrench to the gut. Available from the Red Penny Papers! Alan Baxter - Alan Baxter is an award-winning British-Australian author who writes dark fantasy, horror and sci-fi, rides a motorcycle and loves his dog. He also teaches Kung Fu. He lives among dairy paddocks on the beautiful south coast of NSW, Australia, with his wife, son, dog and cat. He is the author of the dark urban fantasy thriller trilogy, Bound, Obsidian and Abduction (The Alex Caine Series) published by HarperVoyager Australia and Ragnarok Publications in the US, and the dark urban fantasy duology, RealmShift and MageSign (The Balance 1 and 2) from Gryphonwood Press. As well as novels, Alan has had more than 70 short fiction publications in journals and anthologies in Australia, the US, the UK and France. His short fiction has appeared in The Magazine of Fantasy & Science Fiction, Beneath Ceaseless Skies, Daily Science Fiction, Postscripts, and Midnight Echo, among many others, and more than twenty anthologies, including the Year’s Best Australian Fantasy & Horror on several occasions. His first collected volume of short fiction, Crow Shine, is out now. At times, Alan collaborates with US action/adventure author, David Wood. Together they have co-authored the horror novella, Dark Rite, the action thriller, Blood Codex (Jake Crowley Adventures Book 1), and the forthcoming giant monster thriller novel, Primordial. Alan has been a finalist in the Aurealis Awards, a three-time finalist in the Australian Shadows Awards and a five-time finalist in the Ditmar Awards. He won the 2014 Australian Shadows Award for Best Short Story (“Shadows of the Lonely Dead”) and the 2015 Australian Shadows Paul Haines Award For Long Fiction (“In Vaulted Halls Entombed”), and is a past winner of the AHWA Short Story Competition (“It’s Always the Children Who Suffer”). Read extracts from his novels, a novella and short stories at his website – warriorscribe – or find him on Twitter @AlanBaxter and Facebook, and feel free to tell him what you think. About anything.